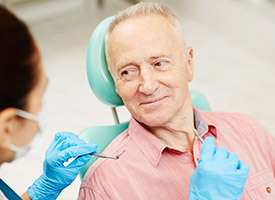 When dental damage and decay are extensive, we might have to rehabilitate your entire mouth using different dental procedures to achieve the desired results. If you haven’t smiled in years because your oral health has suffered from severe dental issues, don’t worry. We can provide you with a full-mouth reconstruction. Dr. Robison will be happy to sit with you and put your mind at ease, letting you know that, yes, you can have a strong and beautiful smile again. To learn more about how he can help rebuild your teeth, contact us today. Why Choose Robison Dental Group for Full-Mouth Reconstruction? What procedures are often part of a full-mouth reconstruction? Which procedures we use for your full-mouth reconstruction depends entirely on your specific problems and oral health. Wear and tear occur naturally and effect everybody; there’s no need to be embarrassed about oral health problems when you walk into our office. Our main concern is simply recapturing dental health, so if you think you might benefit from a full-mouth reconstruction, contact us today for a consultation.